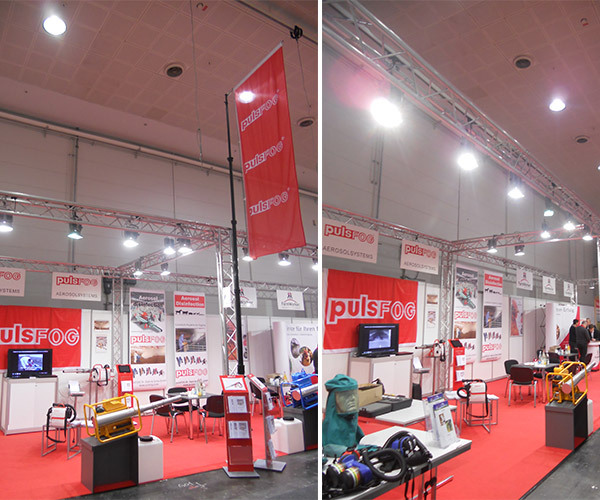 Our pulsFOG team was just in the lovely German city of Hannover exhibiting at the 2014 Eurotier, held 11-14 November, 2014. For the few people who aren’t familiar with Eurotier, it is the world’s leading trade fair for animal housing and management. This is a popular global meeting place for professional animal husbandry experts because it features the latest products, tools and technical developments concerning animal (cattle, pig, poultry, aquaculture, sheep and goat) housing, animal health, agriculture, animal breeding, veterinary and animal husbandry. pulsFOG, alongside our partners Farmworker GmbH and PM Atemschutz GmbH, exhibited to showcase our newest products and fogging equipment that is safe and effective for keeping animals in close quarters healthy by fogging to thoroughly disinfect animal housing. Our aerosol method of applying disinfec­tants not only deposits active product on surfaces, including those which are inaccessible, but it does so very quickly and evenly. We also educated attendees on using similar methods to cover small to large large scale animal vaccinations via safe, fast and cutting edge aerosol fogging. Eurotier is such a large production that it is organized biennially. This year’s tradeshow had over 2,300 exhibitors and an attendance of almost 160,000 … not a bad turn out, eh? Unfortunately, we need to wait another two years before it comes back around again but we hope to be a part of Eurotier 2017!